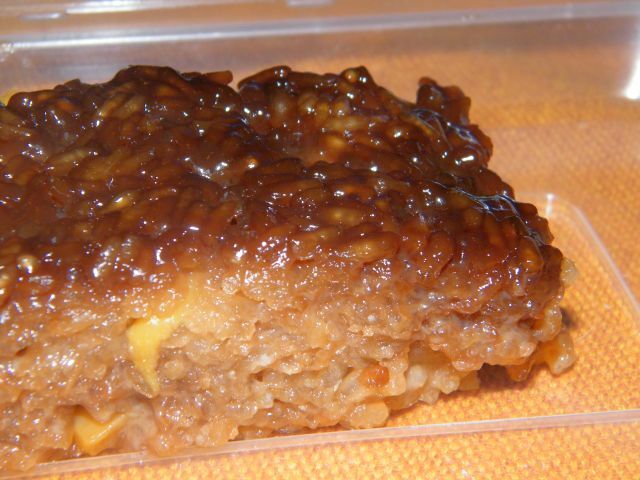 Bico is a traditional Filipino rice cake made with glutinous rice (also called sticky rice) and sweet topping. My wife has actually been cooking bico here at home for a number of times now, as it has become quite a popular treat at gatherings but in place of the brown topping she uses coconut strings instead. I thought I have placed that recipe here, but I could not locate it so I'll dig up some photos to publish here. This bico was made by a friend and we were among the lucky few who received a share. This is one also has a twist to it: there's langka (jackfruit) pieces in it! This is my first time to taste langka with bico and I quite like it! The topping's sweetness is also just right. I love it. Nope, no recipe for this one (sorry) but I'll put up the one my wife makes soon. OOOOO!! Langka! Have never seen langka in Bico. I will have to see if I can find some, not a lot of Pinoy stores in Utah; and if there is kind of expensive.